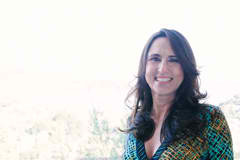 Claudia Vasconcelos moved from Brazil to San Francisco in 1993 where she became a passionate health advocate. She has been practicing meditation and yoga since 1998. She is also a dedicated Massage Therapist and Clinical Ayurveda Specialist with a degree from the California College of Ayurveda. In 2006 she completed her 500-hour teacher training certificate program at the Iyengar Yoga Institute of San Francisco and continues to extend her studies with the Iyengar family in Pune, India. Claudia received her Yoga for Scoliosis certification from Elise Miller in 2012 and she has been offering yoga for scoliosis workshops at the JCCSF. She feels moved by the outcome and remarkable benefits yoga has given to her students. She is currently teaching workshops, private and group yoga classes in Marin and San Francisco area.